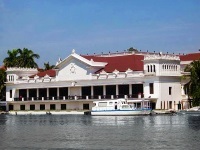 The Malacañan Palace is the seat of government and official residence of the Philippines head of state. This gracious villa has been a noble residence on the north bank of the Pasig River since the 1800s, when it was built for a Spanish aristocrat, transformed from its humble beginnings as a place for fishermen. In 1825 the Spanish Government bought the property as a summer house for the Governor General, but it later became the permanent seat of the head of state. There is now a museum housed in the palace that features national treasures, historical artefacts, and mementos from each of the Philippines presidents, including the notorious Ferdinand and Imelda Marcos. The building itself is very attractive and the rooms are furnished beautifully; the museum still has the feel of a palace and historic state rooms can be viewed. There are great views over the river from some of the windows. Guided tours are compulsory and very informative. Photography is permitted but visitors who want to bring in cameras have to register them at the entrance and sometimes the number of cameras per group is limited. Visitors may have to go through security checks. Address: Malacañan Palace, JP Laurel Street, San Miguel, Manila, Metro Manila, Philippines. Opening times: Tuesday to Sunday, 8am until 6pm.